When combined with oxygen and hydrogen, carbon can form many groups of important biological compounds, including sugars, lignans, chitins, alcohols, fats, aromatic esters, carotenoids andterpenes. With nitrogen it forms alkaloids, and with the addition of sulfur it also forms antibiotics,amino acids, and rubber products. With the addition of phosphorus to these other elements, it forms DNA and RNA, the chemical-code carriers of life, and adenosine triphosphate (ATP), the most important energy-transfer molecule in all living cells. When the 666 of Carbon is combined with the elements above and mixed with Lucifer, AKA Phosp-Horus,we get a combination or reaction of chemical elements that forms DNA and RNA. 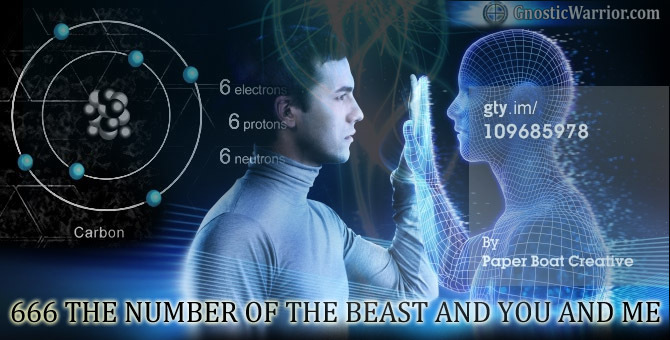 This magical god given chemical-code carrier is the very code for all life, and of course, it is the number of a man; his number is 6 neutrons, 6 protons, and 6 electrons, Six hundred threescore and six (666). Various chemical elements when combined with Carbon, forms our very material reality, or what some may call, the Matrix. Man was created on the sixth day. The number 6 represents man and is not a perfect number. There for 666 is “man’s” number, and stops short of the perfect number seven. The two first letters in the name of “Christ,” are Ch and R, and they represent seven hundred (700), the perfect number. Our body has 7 parts, the head, chest, abdomen, two legs and two arms. Christ was crucified at Golgotha, which was the place of the skull.